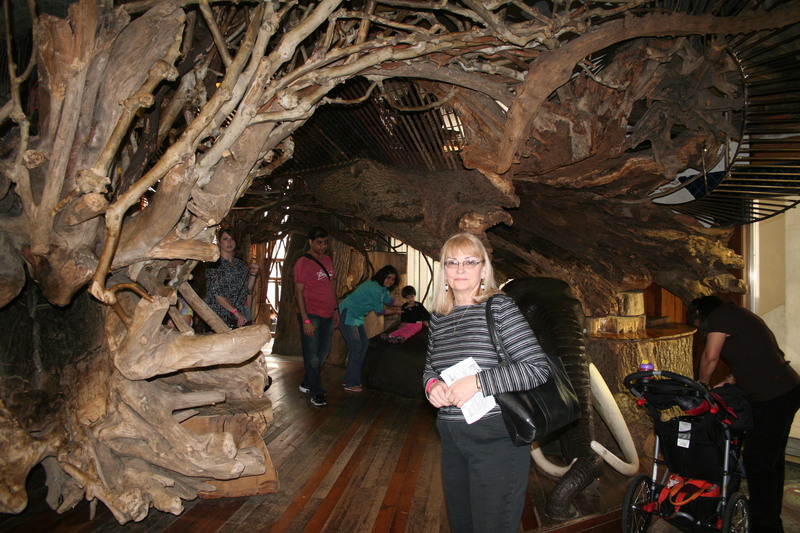 City Museum: Quirky, quaint, fun! It’s quirky. It’s quaint. It’s fun. 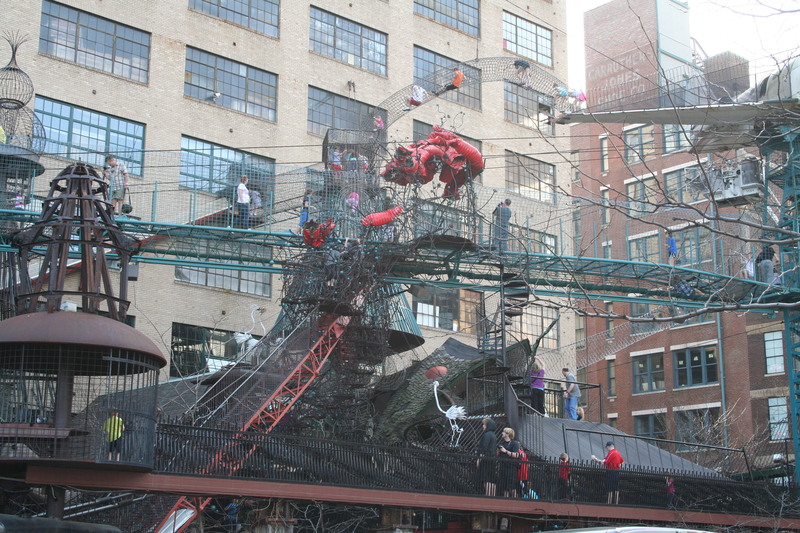 The City Museum in St. Louis, according to its website (citymuseum.org), is “where the imagination runs wild.” And after a visit to the 600,000-square-foot building at 701 N. 15th St., you’ll likely agree with that claim. This one-of-a-kind museum occupies several floors of a 10-story former International Shoe Co. factory. It’s the brainchild of artist Bob Cassilly and friends, who built the place out of – get this – reclaimed building materials and other assorted junk they’ve found. Inside you’ll also find hundreds of authentic relics from the past – from a chest-type Coca-Cola machine to a former bumper car at a carnival – that’ll have you waxing nostalgic. There’s truly something for every age. The first thing you need to do is park your car, which costs $5. Parking and the museum’s main entrance are on 16th Street. When you leave your car, you’ll immediately see MonstroCity, an outdoor interactive sculpture and multi-story playground with tunnels, skywalks and a slide. Highlights include a fire truck and airplane to explore. 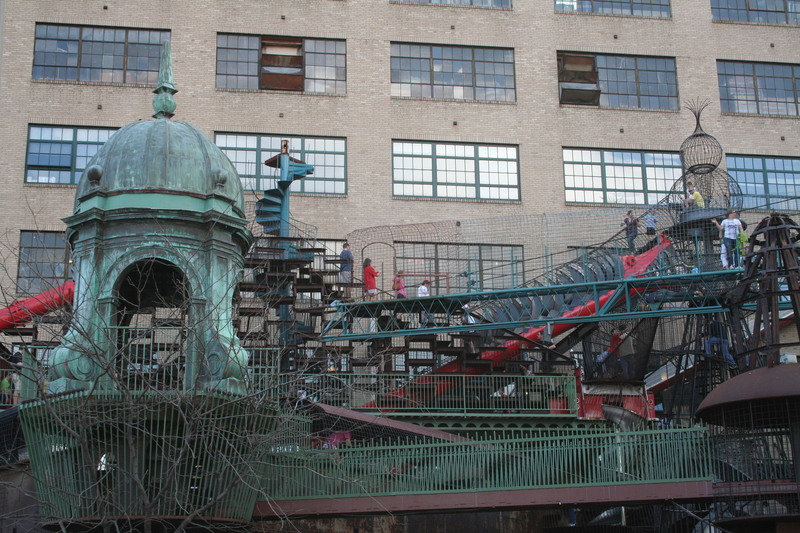 Now glance up at the rooftop playground, which includes multi-story monkey bars and Big Eli, a restored, working, four-story Ferris wheel. Wait! 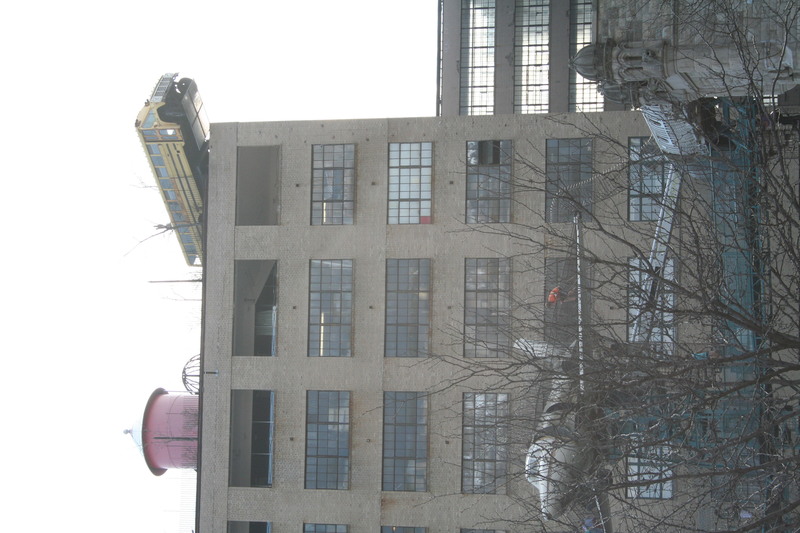 Is that a full-size yellow school bus hanging over the edge of the roof? Sure is, and the daring can even climb in and slide behind the steering wheel if they wish. 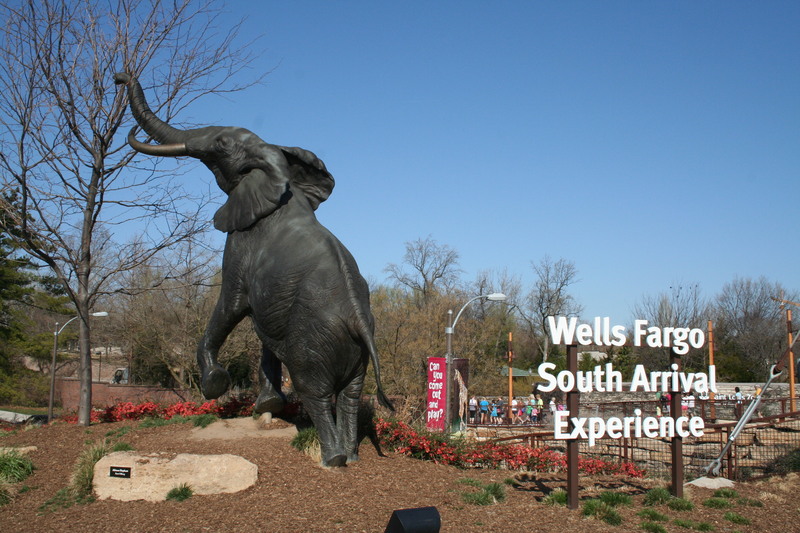 $12 plus tax or $10 plus tax after 5 p.m. Fridays and Saturdays. costs an extra $6 plus tax. But fear not, there’s plenty to see and do at the museum even if you pass up those places. 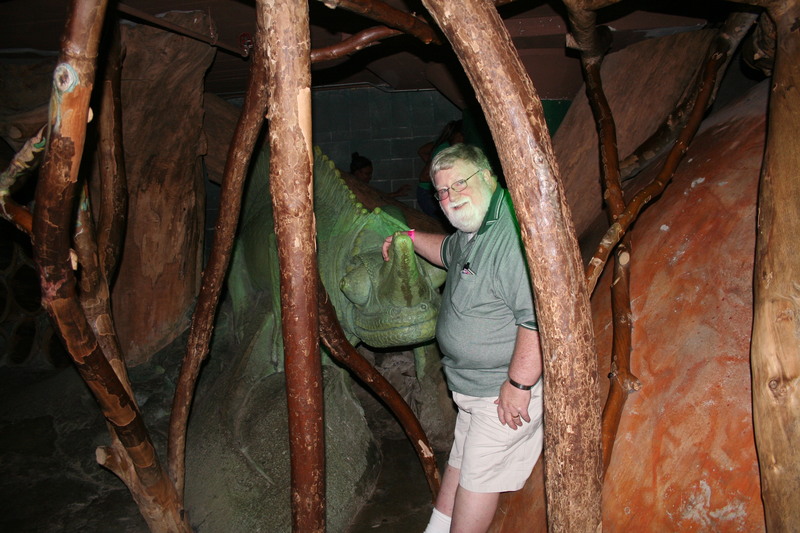 Once inside, kids will be instantly be drawn to the first floor’s tree house, 5,000-gallon tank of fish that are native to Missouri waters and labyrinth of tunnels, filled with larger-than-life creatures. Before moving on, take a stroll through a life-sized whale and be sure to find the Puking Pig, an old boiler atop an 1880s fire pump. It periodically fills with water, then swivels and dumps its load into the wave cave below. 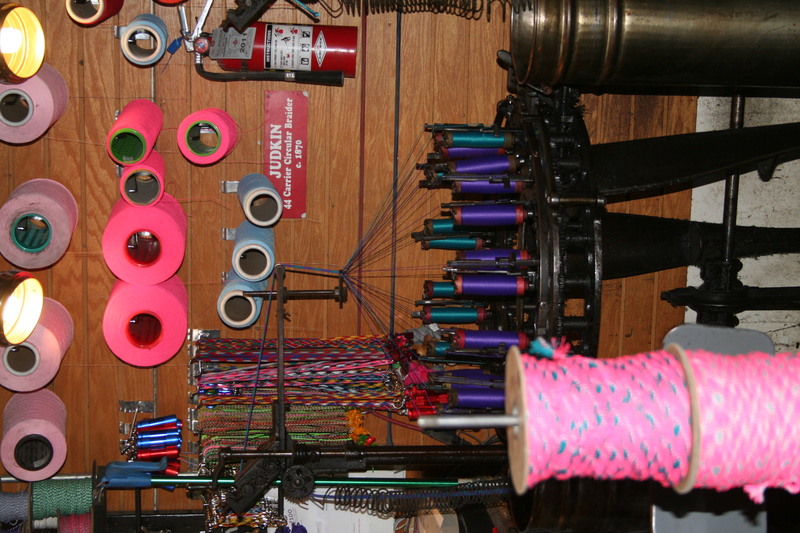 Now start making your way upstairs, where you’ll be amazed at the working vintage shoelace machines that once used to make bootstraps for U.S. soldiers during World War II. Now, they crank out brightly colored shoelaces, bookmarks, bracelets and necklaces that you can buy. Kids can ride on a miniature train while adults ponder the creatively decorated shops nearby that sell sandwiches and drinks. 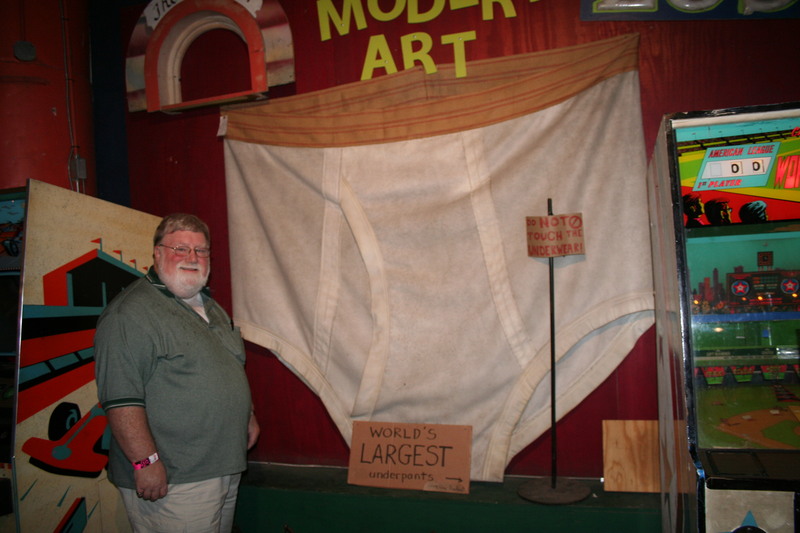 Dine amidst colorful neon signs, vintage posters, movie lights, pinball machines and the world’s largest pair of underpants. When it’s time to move on, check out the insect and pencil collections and the intricate gargoyles and other architectural gems saved from the wrecking ball. 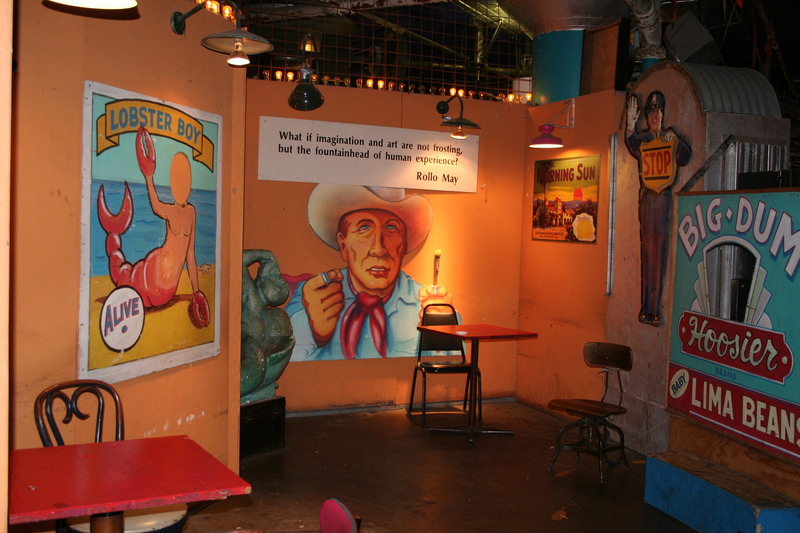 Belly up to the long wooden bar and imagine a cowboy standing beside you. Or walk inside the ornate elevator cage or bank vault you’ll find on display. 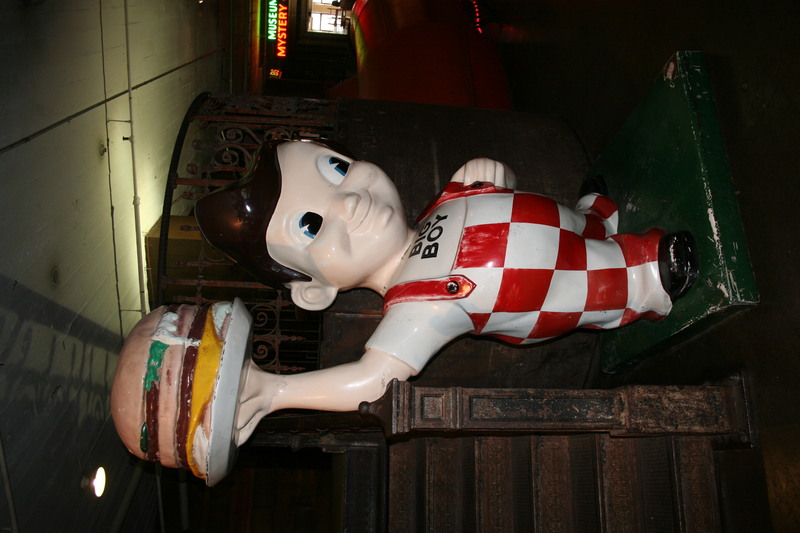 Study a primitive toilet and bathtub, then touch that iconic American statue – a smiling Big Boy holding a thick burger on a plate over his head. Like vintage clothes? Do you need an authentic red or blue band member’s jacket? 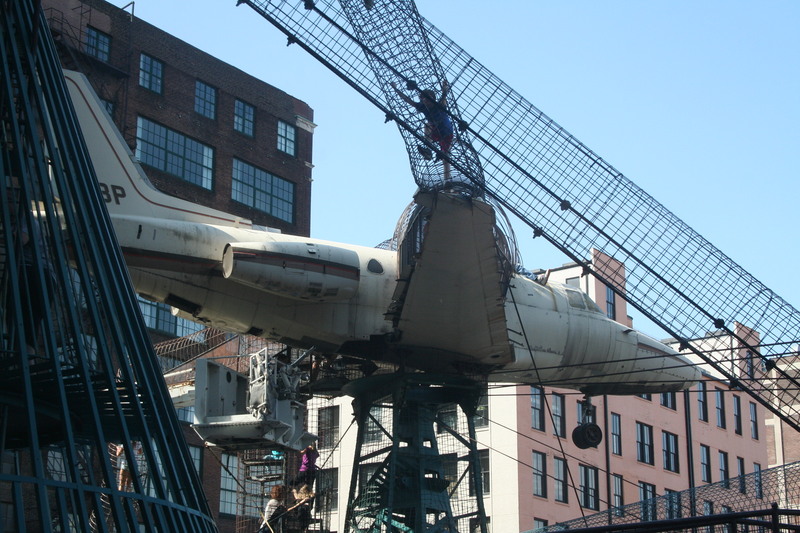 City Museum has them. 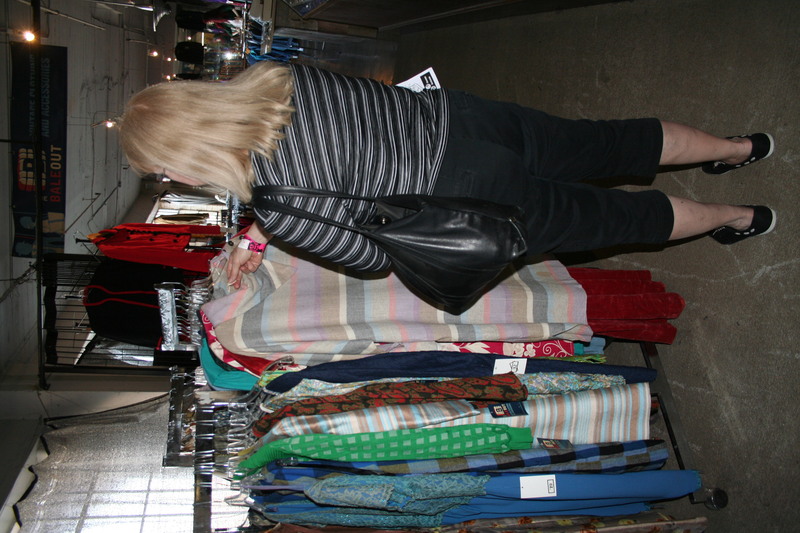 There’s a whole floor of old-time sweaters, ties, jeans and dresses for sale. And there’s more for the kids to do, too. They can build something big using hundreds of building blocks or learn how to swing on a trapeze. 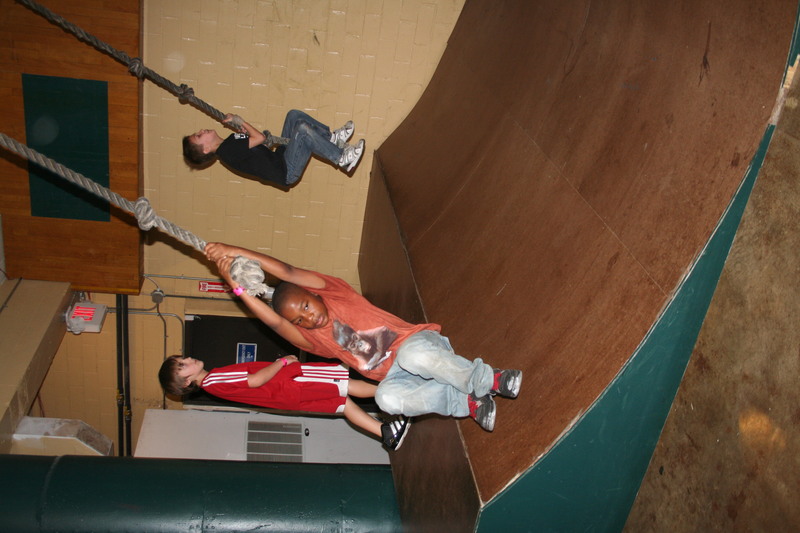 They can make some crafts to take home or use some ramps for running and ropes for swinging. What am I missing? Lots! 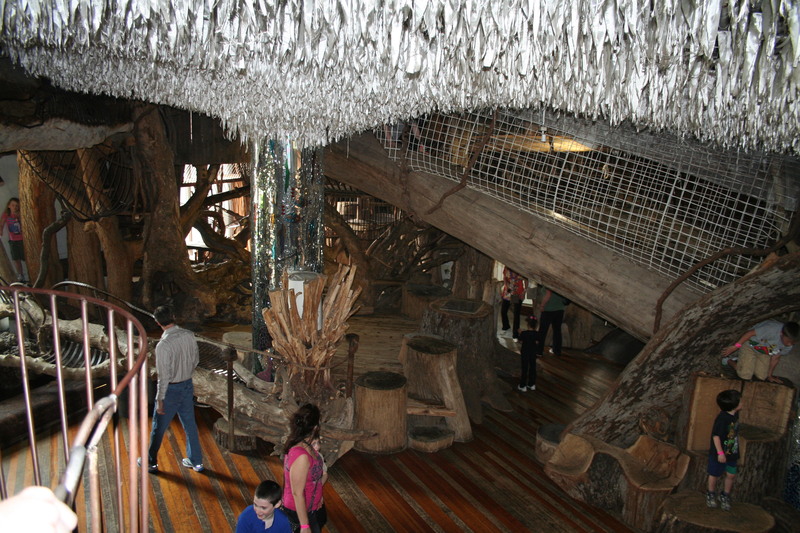 City Museum has nearly 100 displays. Spring break 2012: Hello St. Louis! My wife’s a teacher. And each year for many years during Sherry’s spring break, we travel somewhere new and different. We’ve been all over the country. Depending on our destination for a particular year, we sometimes run into wintry weather. Most of the trips, after all, fall in March. We walked through snow, for example, to see the ocean in Maine. And we stayed with snowmobilers at a motel in the hills of Vermont. But the upside of a spring break trip is that there generally are no long lines at our destinations. The only other travelers, for the most part, are other older folks or families who also are on a spring break trip. 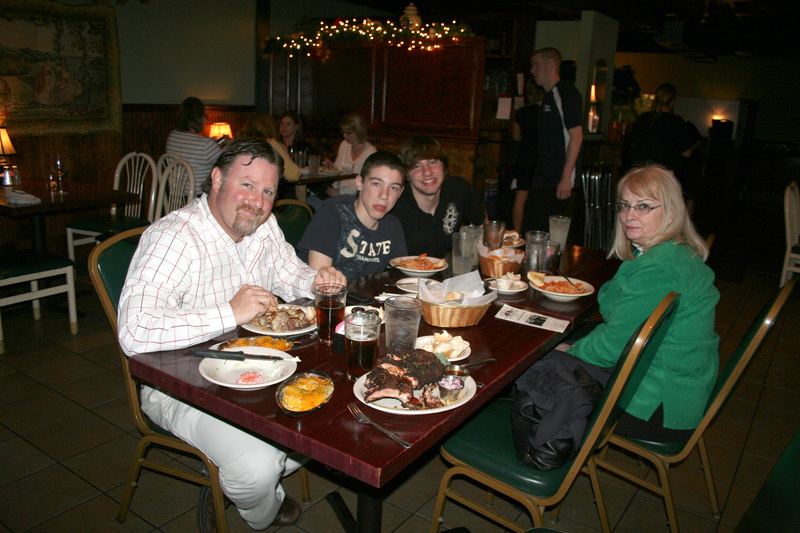 This year we decided to visit a familiar and favorite place, St. Louis. 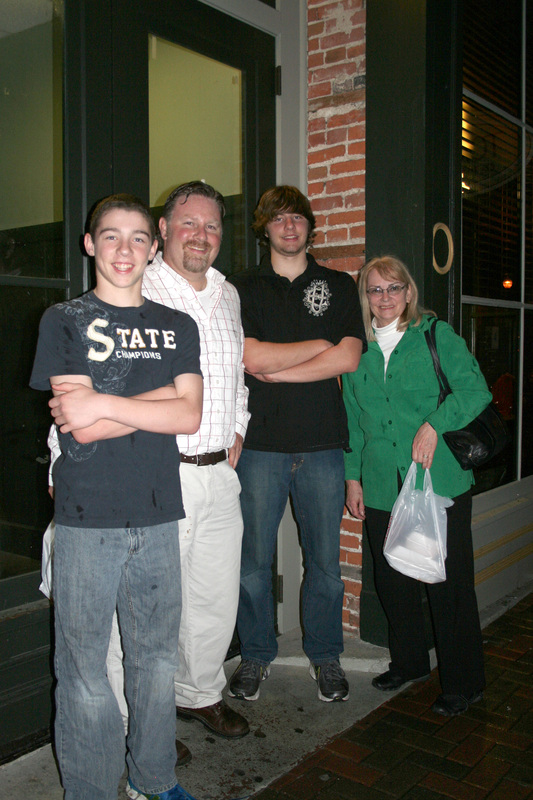 That’s also where our son Brendan and grandsons, Pierce and Cade, reside. 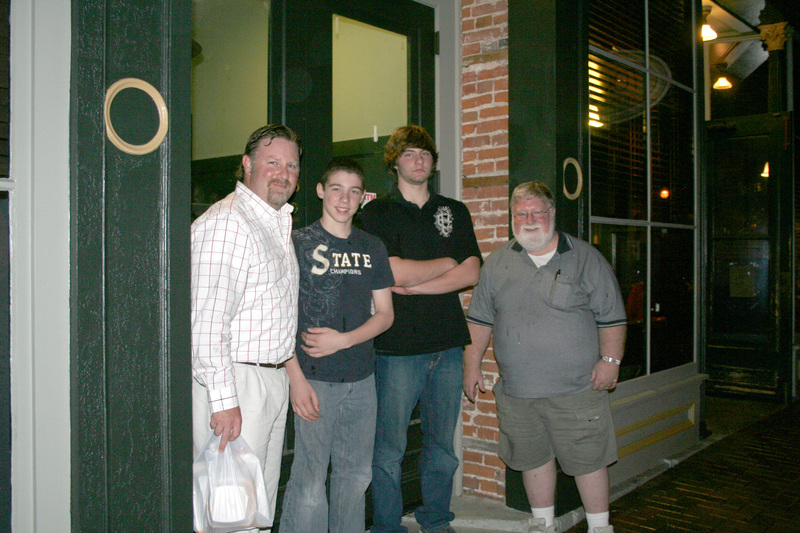 Brendan works during the day, and his boys were in school – their spring break had not yet begun. But our visit allowed us to stay with them, spend time with them each evening and go sightseeing on our own during the day. We drove down on a Monday and back home the following Friday. Tuesday through Thursday were spent visiting various attractions. 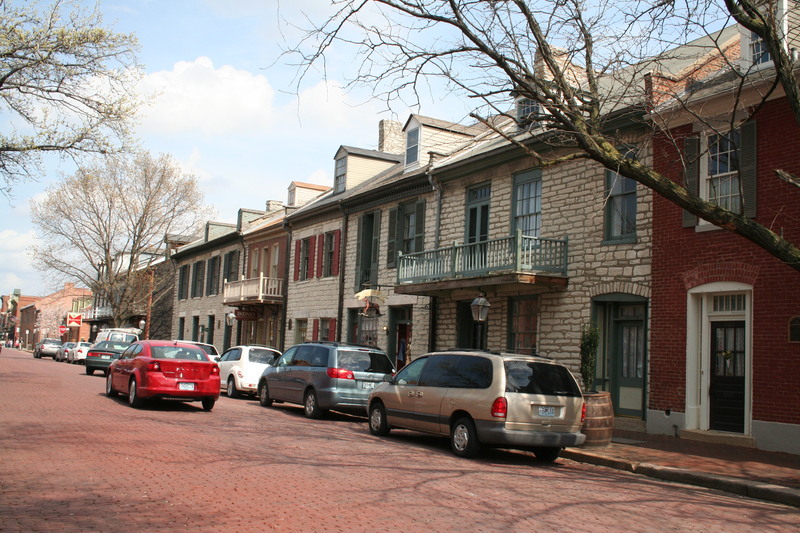 We toured the St. Louis Zoo on Tuesday; the City Museum and a historic Route 66 attraction, Ted Drewe’s Frozen Custard, on Wednesday; and the shops and beautiful old buildings of St. Charles’ historic district on Thursday. I’ve crossed yet another item off my bucket list — that list of things I want to accomplish before I meet my maker. With wife Sherry and grandkids Harrison and Marin in tow, I attended a roller derby competition, the Quad City Rollers vs. the Crash Test Dolls from Des Moines at the RiverCenter. Admittedly this was not a major bucket list goal. It was easily accomplished and fairly inexpensive as entertainment goes. But a goal is a goal no matter how small, and it was nice to mark it complete and have fun doing so. I happily discovered that today’s roller derby is not like the choreographed roller derbies I watched on television as a teen in the 1960s. They took place on banked tracks surrounded by a railing into which — or over which — competitors regularly sailed at the hands of the opposition. 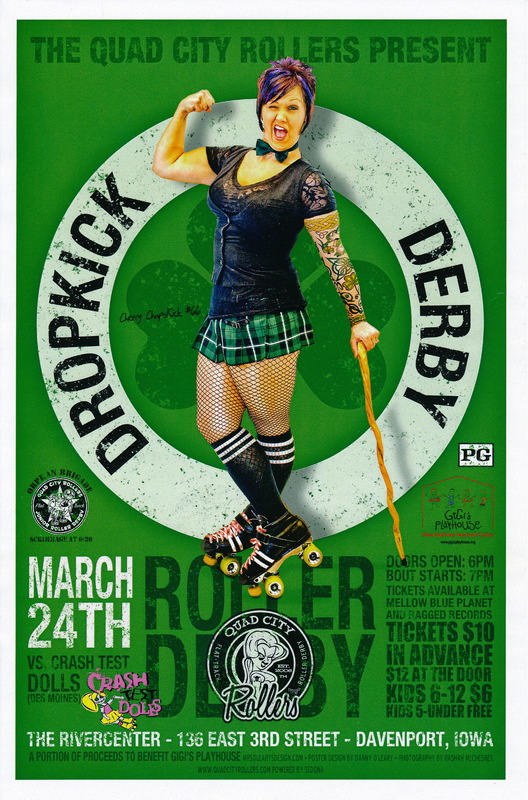 If there was a purpose to the old way of doing roller derby aside from knocking an opponent down or getting into a scuffle, it was lost on me. To my way of thinking, the old roller derbies were more like All-Star Wrestling on wheels than any sort of true competition. 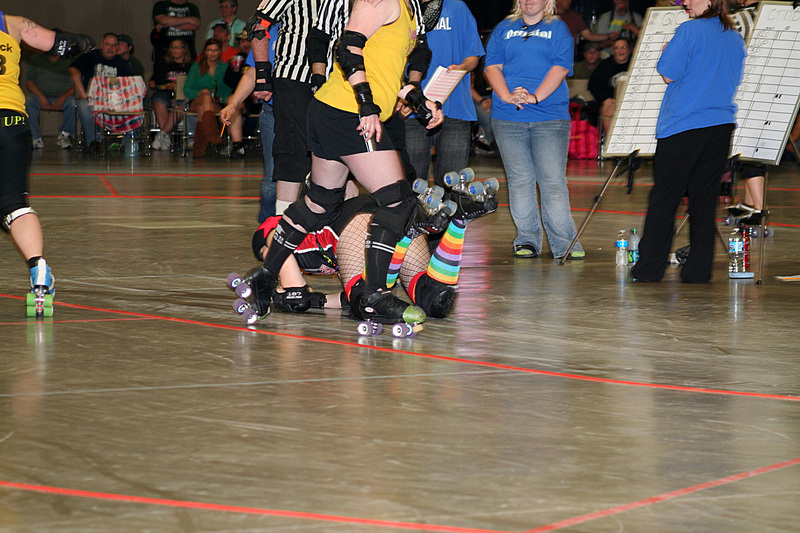 It’s not like that now, at least for the Women’s Flat Track Derby Association, which sanctions the Rollers’ events. 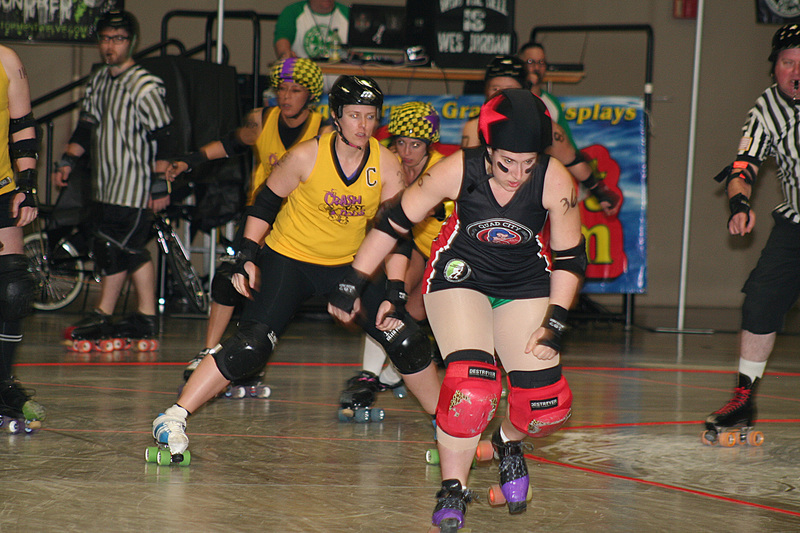 It’s a valid team sport — nearly a dozen dates, both home and away, are on the Rollers’ schedule — at which points are scored. And there are rules, like no pushing from behind. It’s also great fun to watch and, I’m guessing, to play. 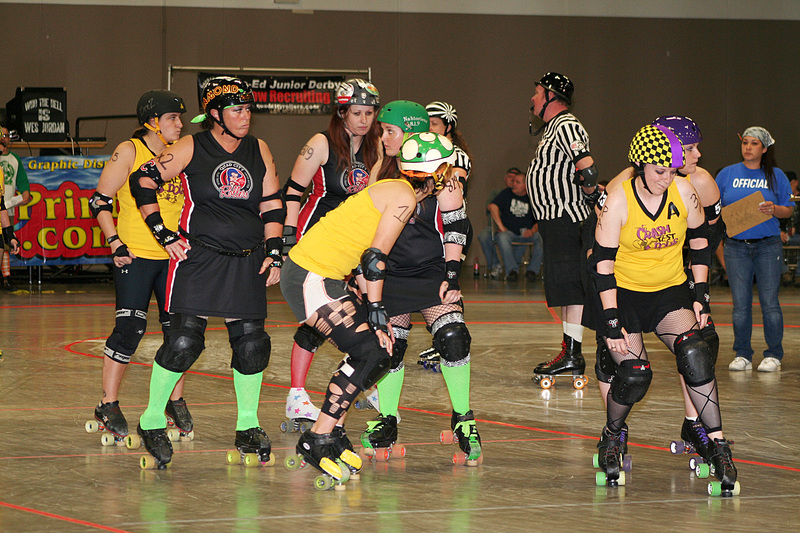 Skaters for the Rollers go by monikers like Twofist Tallulah, Bootius Maximus, Destroyovsky, Cherry ChapsKick and Sweet Daisy D’Mise. A coach answers to Chicks Ahoy. The Crash Test Dolls sport names like Z’ro Tolerance, Hot Whips Houlihan and Dinah Soar. 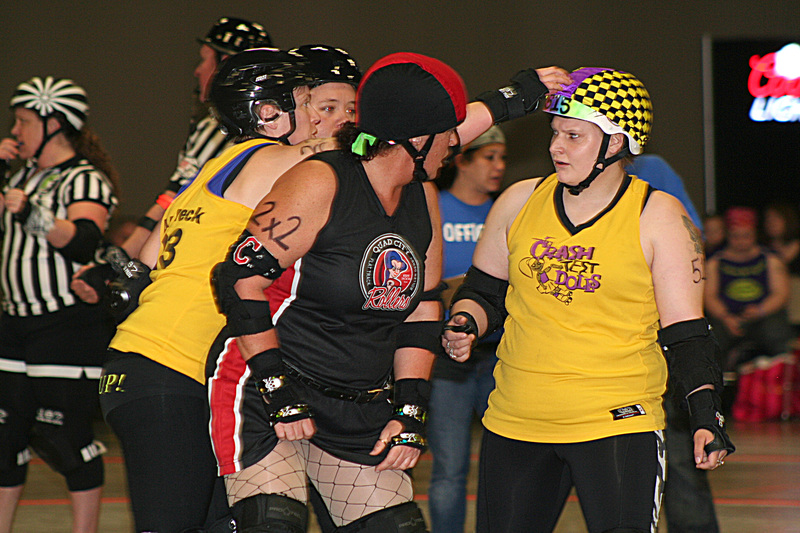 The roller derby girls come in all shapes and sizes. All have to be at least 18 to participate. 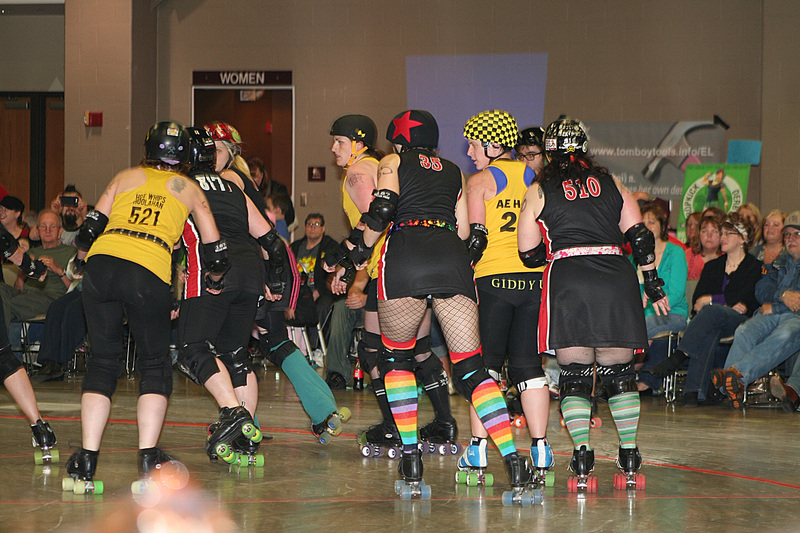 The night we attended, the Quad City Rollers wore black miniskirts and sleeveless jerseys, fishnet nylons and a variety of colorful knee-high socks. 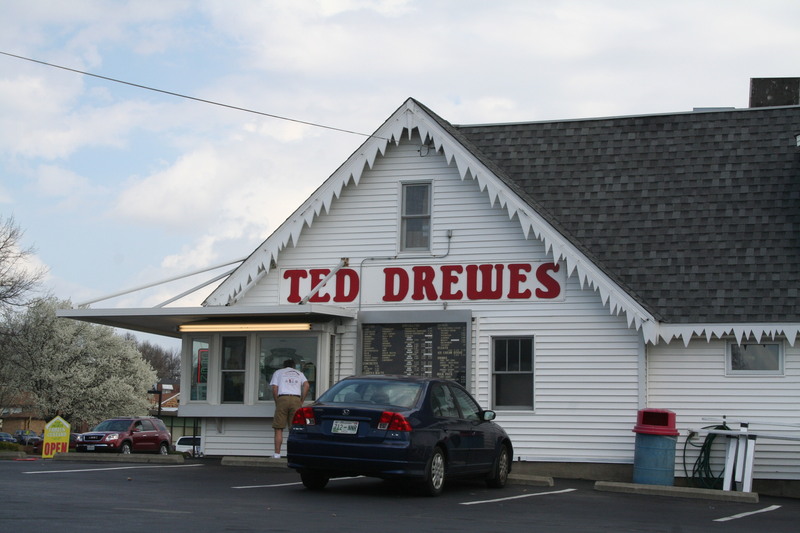 They also wore the kind of skates — with four wheels for each foot – that I rented as a kid when I skated at two now-closed rinks, The Prom on Brady Street and the Roll-a-Rama at the Mississippi Valley Fairgrounds. 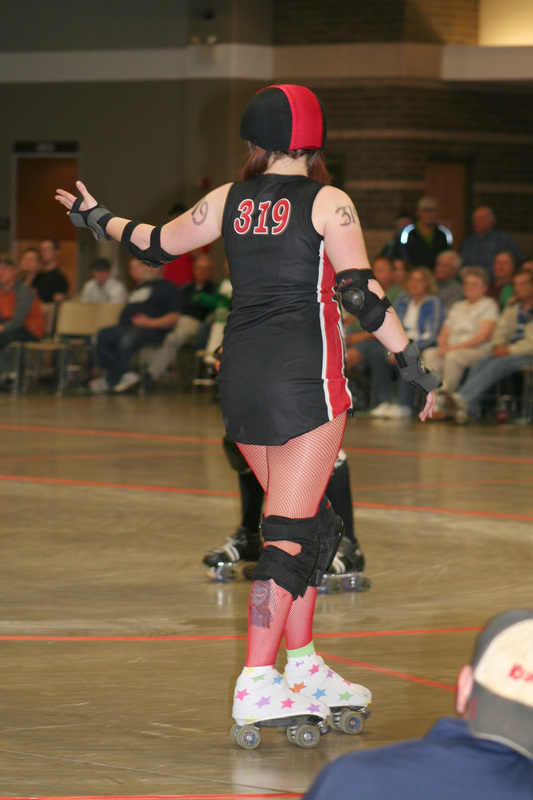 For safety, the skaters wear kneepads, elbow pads, helmets and mouth guards. A couple hundred spectators, including lots of families, showed up the night we attended. People sat in unreserved chairs surrounding the flat, oval track, which was marked by tape on the concrete floor. I would have liked to have taken a place in the first row but thought better of it, since we had grandkids with us. They call row one the “suicide” section. If you sit there, out-of-control skaters are likely to end up in your lap. The competition was a pleasant change of pace from the stick-and-ball sports. 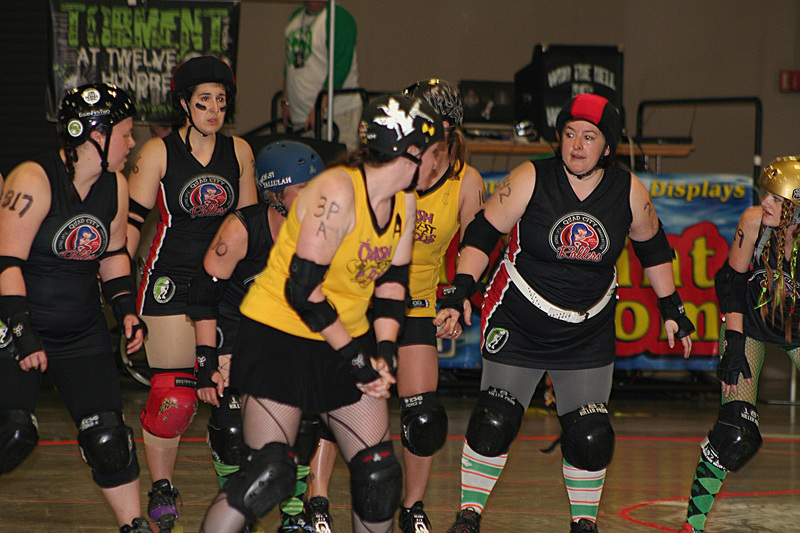 Before it started, the Rollers’ announcer graciously explained for newcomers the objectives of the various team positions and how the teams score points. A bagpiper provided halftime entertainment, and the Rollers signed autographs and posed for pictures when it was all over. 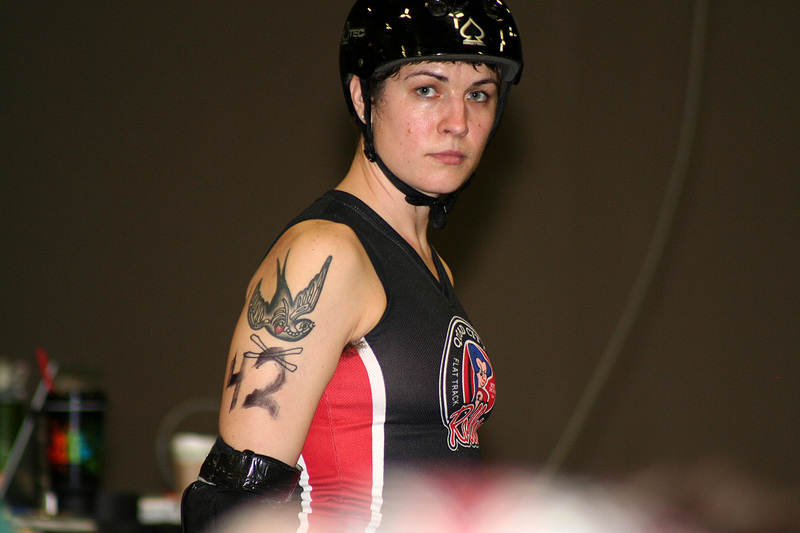 That helps put a positive face on roller derby.